Harry Strange is an award winning radio drama that tells the tale of a private investigator whose beat takes him into the supernatural. Harry's adventures bring him face-to-face with demons, succubi, vampires and all manner of 'unnatural', and the occasional 'natural', evil. “Magic and magical people — the ‘unnatural order’ is all around us. There are white witches, black witches, demons, vamps, werewolves, shape shifters, ghosts; it’s a protoplasmic party of creature features out there. But unless you know where to look, you won’t find them. I know where to look. The most recent episode is always located here on our Podcast Page. If you are a new listener and want to know where to begin, please click on the New Listener link in the menu bar. Harry Strange episode 316: What Lovecraft Said Part 3 was written by Tony Sarrecchia and directed by Jason Tyler. Sound Design by Molly Silverman and Tony Sarrecchia. All material is copyright (c) 2018 by Tony Sarrecchia and used with his permission. Harry’s opening and closing theme music was written and performed by Ryan Lessard and is copyright by Ryan Lessard and used with his permission. Contact Ryan at: rlessardmusic@gmail.com. Incidental music was written and performed by Kevin Macleod and is copyright by Kevin Macleod and used with his permission. Visit incompetech.com/ for more of Kevin’s music. Harry Strange What Lovecraft Said parts one, two and three were recorded at the Atlanta Radio Theater Company Studios in Atlanta Georgia. David Benedict recording engineer. The biggest thanks of all goes to our listeners:Thank you for an incredible three seasons! For the Harry Strange Radio Drama, I am JoAnn Pruden. Goodnight and keep listening to audio drama. Buy a book, would ya! In order to support the Harry Strange Radio Drama and assist in offsetting future costs, I have released the first season scripts in book format. By purchasing a print or Kindle copy, you not only get 400 heart-pumping pages of bourbon soaked, supernatural goodness, but you are helping with the cost of getting into a studio, feeding the actors, and enhancing the production value of future episodes. “Harry Strange in The Stones of Solomon” begins when Lilith first hires Harry to search for her lost artifacts and follows through his adventures in the first season including his origin story and the introduction of the creepy Mr. K.
So go ahead and pick-up a copy for you, your neighbor, and your local library. We appreciate your support! 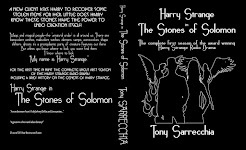 Click here to purchase a copy of "Harry Strange in The Stones of Solomon"
All content is Copyright (c) 2011-2015 and beyond by Tony Sarrecchia.